Project Baseline’s team conducted over 100 video transects of coral reef and benthic habitats of the Great Astrolabe Reef in Fiji, one of the largest barrier reefs in the world, to compile baseline reports in order to effectively monitor the health of the reef. Scientists deployed the submersible Moby, from the research vessel Ad-Vantage, to do research on the Great Astrolabe Reef in Fiji, one of the largest barrier reefs in the world. Having completed two high-profile collaborative research projects in 2016—one with the National Oceanic and Atmospheric Administration (NOAA) documenting the U-576 WWII German submarine at a depth of 721ft (220m) off North Carolina along the US East Coast, and the other working with the Nekton Oxford Deep Ocean Research Institute (Nekton) to conduct the XL Catlin Deep Ocean Survey in Bermuda—Project Baseline continues to find ways to broker and facilitate needed underwater exploration and research. 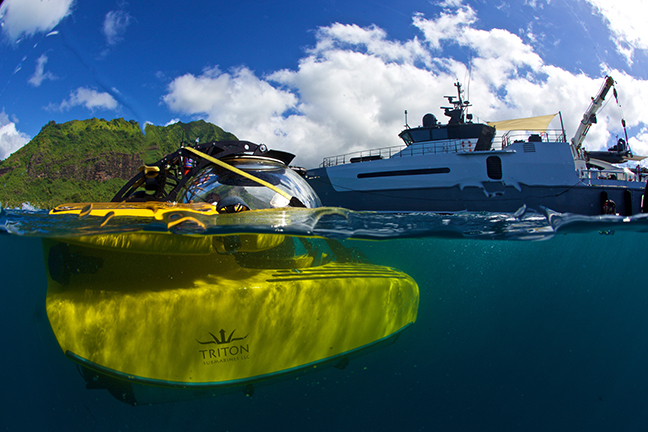 Its recent proof-of-concept project in Fiji conducted in collaboration with scientists from the University of the South Pacific (USP), based in Suva, Fiji, and Nova Southeastern University (Nova) in Ft. Lauderdale, Florida, and the super-yacht owners who provided the vessel, is a prime example. Over the 14-day mission on 14-27 May 2017, Project Baseline’s team conducted over 100 video transects of coral reef and benthic habitats of the Great Astrolabe Reef, one of the largest barrier reefs in the world, facilitated dives for scientists from USP and Nova, and conducted 12 dives on submersible Moby collecting vertical video transects from depths of 50 to 362m. In addition, they were able to engage with the local communities in Malolo and Kadavu on the mission and its relevance to their historical and cultural relationship with the sea. “The mission allowed us to monitor the health of the northern-most part of the reef far from human settlements and haunts and contrast it with areas near tourist hubs. The Fijian government doesn’t have the resources to do this by itself,” explained Dr Ciro Rico, head of marine sciences at USP, who along with his students, is preparing a baseline report based on the data that was collected. The report will be used to help government policy-makers protect Fijian reefs. Ironically, the origins of the Fijian project stretches back to 1998, the year that Jarrod Jablonski and now Project Baseline director Todd Kincaid, formed Global Underwater Explorers (GUE). At the time, British accountants-turned-divers Mel Jeavons and Jamie Obern volunteered with the National Trust of Fiji, a Fijian government-sponsored conservationist organization, to run a coral and fish survey of the remote islands. There, they befriended a fellow volunteer named Sarah. Flash-forward nearly 20 years to 2015/2016, Jeavons and Obern, who got married and became GUE divers, were running their training company Tech Dive New Zealand, based in Tutukaka, Northland. Meanwhile, their friend Sarah Foulis was now the chief stewardess and wife of the captain of the luxury yacht M/Y Vantage, which operated in the South Pacific. Even better, the ship’s owners (who want to remain anonymous) were interested in donating their support vessel, M/Y Ad-Vantage—a 55m research vessel, which included a submersible and dive boats—for use in ocean research by recognized non-profit organizations. Jeavons, with the help of Jablonski and Kincaid began work on securing the ship. Jeavons received the go-head on the boat in late 2016, but it took until mid-April 2017 to work out the details. Direct costs for the two-week survey project came to over US$300,000, most of which were ship-related, but this included an amount for operating expenses, which was also fully funded by the owners of Ad-Vantage. That gave Kincaid and the Project Baseline team just three weeks to pull the project in Fiji together to meet the ship’s sailing window—the most critical item being getting the necessary permissions from the Fijian government. Kincaid and Jeavons engaged Rico at USP, who said he would welcome the collaboration. Rico wrote a request letter and had it hand-delivered to the Prime Minister of Fiji. However, there was no time to wait for approval before organizing the rest of the project. Kincaid had already engaged marine scientists Brian Walker and Charles Messing at Nova, and scrambled to assemble the rest of their citizen scientist research team—including New Zealand-based GUE instructor Russell Hughes, Tech Dive New Zealand photographer Rob Wilson, explorer Martin McClellan of SS Tahoe fame, submersible pilot Randy Holt and safety officer Shane Zigler—and make travel arrangements. However, organizing a scientific mission in three week’s time was not their only challenge. They still needed to secure permission to dive from the local village chiefs who oversaw the fishing grounds, which was accomplished with the help of Rico and USP. In addition, sea conditions arising from Tropical Cyclone Ella, which passed north of their target area the day before the expedition was scheduled to begin, forced the team to delay the diving for three days and seek out alternative protected locations. Interestingly, the coral reef transects, which were taken during three-hour or longer rebreather dives, were limited to 100ft (30m) of depth due to the fact there was insufficient time to obtain any helium. GUE’s Project Baseline evidently practices what it preaches. Michael Menduno is an award-winning reporter and technologist based in California, USA, who has written about diving and diving technology for more than 25 years and coined the term “technical diving.” He was the founder and publisher of aquaCORPS: The Journal for Technical Diving (1990-1996), which helped usher technical diving into the mainstream of sports diving, and organized the first Tek, EUROTek and AsiaTek conferences, as well as Rebreather Forums 1 and 2.